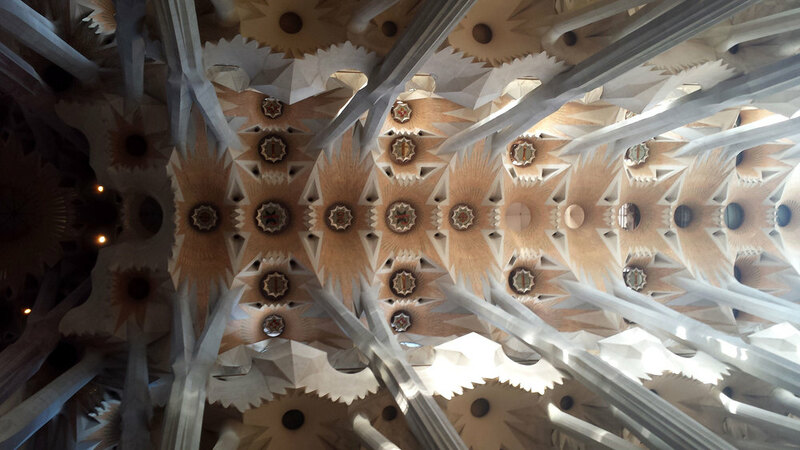 You go to Barcelona to see the Sagrada Familia, or you don't go at all. And if it weren't for the insistence, and delightful nerding out of my Architecture major comrades, I daresay I might have passed it right on by. It's a monolith to God. And from the outside, it looks particularly insane, dark sooty brown and covered in sculpture worse than Baroque. It's shrouded in scaffolding, mile high cranes and wrapped inside iron gates fifteen feet in the air. Cranes and scaffolding because it's being restored, right? Construction started in the late 1880s, but no. Cranes and scaffolding and color differentiation because La Sagrada Familia, over a century since the cornerstone was laid, is still being built. Of course the nave was finished years ago, so they can charge you a hefty admission price to get inside, and make you wait on line for hours upon hours if you aren't savvy enough to buy tickets online. (Do it, it's cheaper, and you don't have to wait.) The construction is for the last handful of the 18 spires and single giant bell tower and main entrance yet to be built. They've got a model of the basilica out on the square color coded to let you know what's still needs to be constructed. And my god, the thing's easily going to be twice as tall as it is now. And after a century, the Spanish, with their unbelievably lovely siestas and late dinners, say it will be done in twenty years. 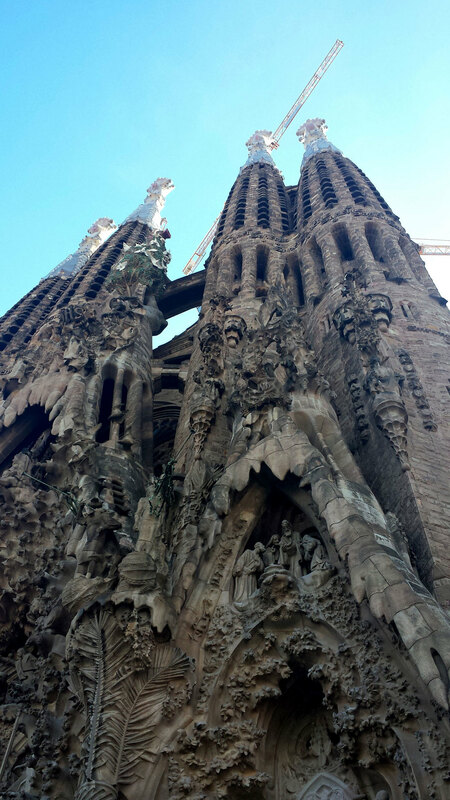 I say I'll be bringing my grandchildren to Barcelona to see it when it's finally finished. I'm not really a fan of the outside, but the nave. Oh, the nave. 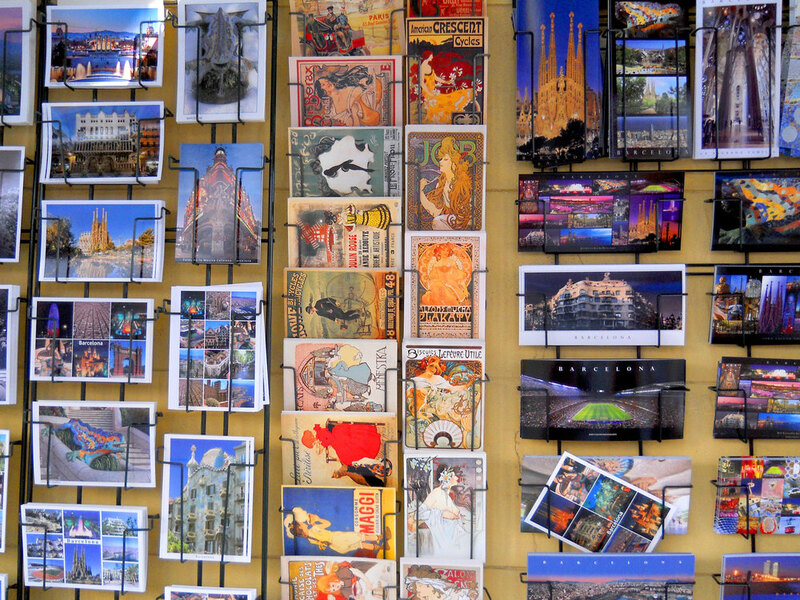 Walking up to Sagrada Familia, you already know that something's different. The current entrance, the Passion Facade, opens like the maw of an Angler Fish, and outside the doors is a sculpture of what I'm certain is two men kissing and embracing passionately. And the doors, huge heaving dedications to typography, are carved in bible versus in a variety of languages, and they are just so modern, and so divine. Then you get inside, and it's like walking into a watercolor forest. The way the sunlight catches the stained glass and filters through the space. The hushed atmosphere, the height, the spiral staircases leading to the top, it's like nothing you've ever seen before. But I will let the pictures speak for themselves. 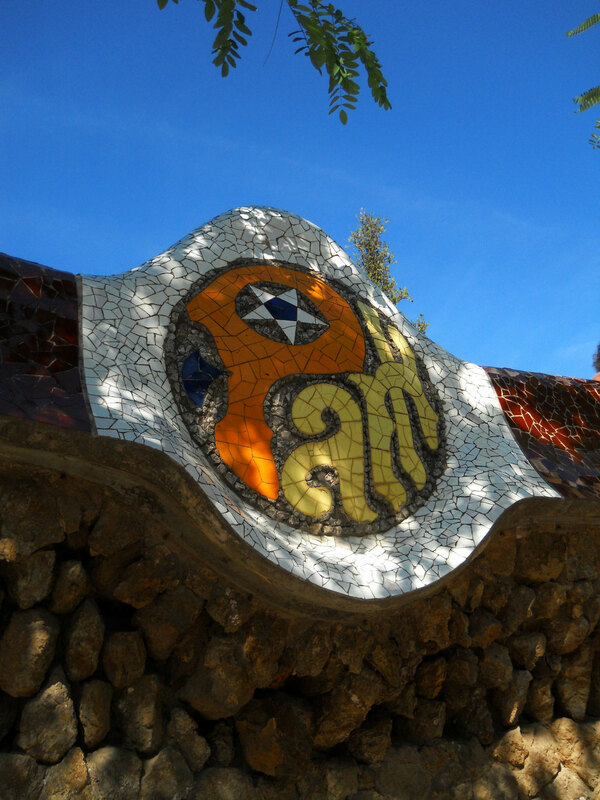 If you have the time, spend the morning in Parque Guell, one of Gaudi's other masterworks that offers views of Barca that rival those a top the Castell de Montjuic, all while feeling like you're wafting through Tim Burton's happy paradise garden. Complete with pigeons. Is there a major city on the planet that has escaped the wrath of pigeons? It's up a hill as tall as Monjuic, but the busses don't go all the way to the top. 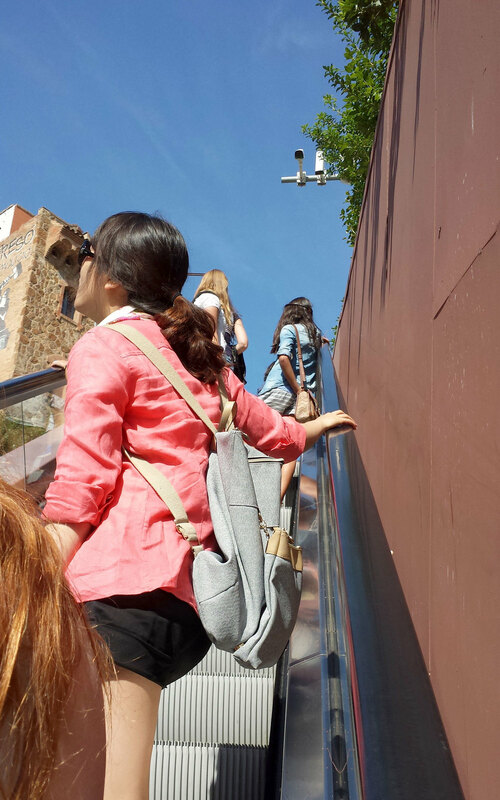 The last half mile is up to you, or the very convenient escalators, should you choose to take advantage of the Catalan bits of ingenuity. And in the evening, after a short respite home, we walked barefoot on the beach, and had a lovely G&T a hundred feet from the crashing waves in an open air oceanside bar. We popped into Oktoberfest, which after leaving Germany (in September, apparently--I mean, come on, it's called October fest), settled alongside Museo Nacional d'Art de Catalunya, complete with carnival, where Claire and I paid 3 euro to ride one of those insanely tall spinning spindly things that Six Flags charges you $20 for. We found dinner in the foothills of the Sagrada, swapping sangria and plates of pasta, because it wasn't traditional Spanish food, sure, but it was better than any Italian we could come to find in London, right? Our flight was at 6AM, and I worked myself into knots wondering if we'd be able to find a taxi to the airport at our calculated departure time of 3AM. So I didn't sleep, even though I was going to go straight from Stanstead to Pimlico for class at 10. But Barcelona has nifty taxi stands, where the free cabs sit until someone with suitcases comes walking across the intersection like the Sahara, flapping their wings asking, Aeropuerto? The perfect easy ending to a lovely weekend away. But really, the real stories are in the pictures.